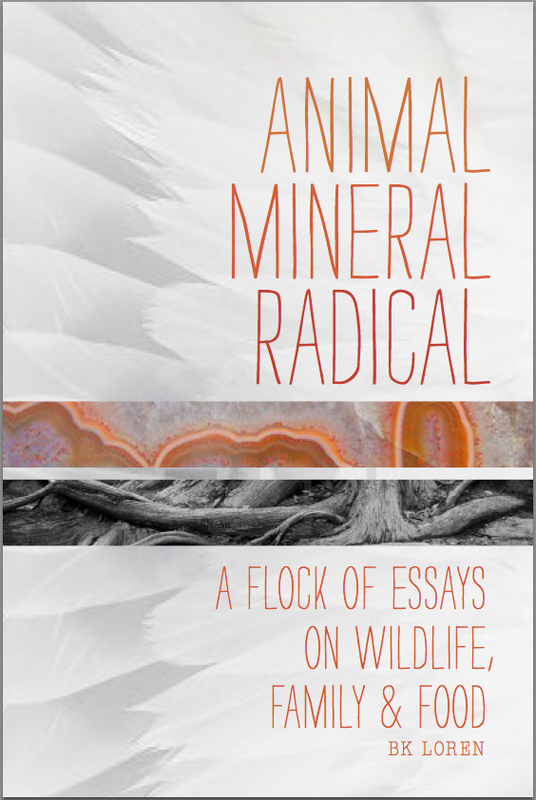 As the title indicates, BK Loren’s new book of essays, Animal, Mineral, Radical: Essays on Wildlife, Family, and Food, invites the fundamental elements of living into concert with one another, to impressive effect. Loren utilizes the lyric prose for which we know her well (from her recent novel Theft) to examine both small moments and large ideas on the page. 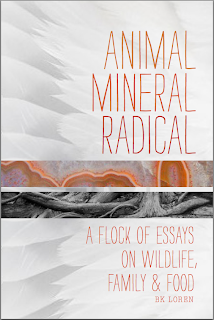 Though the collection of thirteen essays is divided into three sections, ideas of animal—such as the human experience of aging or the awesome yet fragile nature of coyotes—mineral, and radical interact with one another within each essay and throughout the entire book. Such integration is one of Loren’s great strengths as a writer. She provides a space for intersection of what we might think of as discrete inquiries or topics by crafting a container wherein the subjects become fluid and together yield a much larger inquiry. Not only are the stories and subjects incendiary, but her command of language is acute. “Plate Tectonics and Other Underground Theories of Loss,” the collection’s penultimate essay, provides a thought-provoking example of Loren’s exploration of relationships between the physical, natural, and spiritual world. This personal/lyric essay, segmented by the chronology of an earthquake, delves into Loren’s adjacent experiences with depression, the 1989 Loma Prieta earthquake, and the loss of her home and possessions in an aftershock. By writing into each of these, Loren builds a platform for scrutiny of the ramifications of an everyday life disconnected from the natural world. Loren tells us that after the earthquake, she was “opened like sky;” the ensuing portrayals of a regained awe are reminiscent of Annie Dillard, except that Loren goes one step further and, again, holds such awe in concert with the actuality (and sometimes, the banality) of contemporary responsibility and everyday life. Loren lays out her argument for mindfulness with the book’s introduction, where she references a recent essay by the editors of n+1, who posited, “all contemporary publications tend toward the condition of blogs , and soon, if not yet already, it will seem pretentious, elitist, and old-fashioned to write anything, anywhere, with patience and care.” It is no surprise—indeed, it is a great relief—that Loren, who opens Animal, Mineral, Radical with the sentence “Writing is listening,” draws a parallel between the “patience and care” it takes to write well and the patience and care of “the way we view and interact with nature.” What follows are thirteen essays that champion “the power of language,” nature and the compassion yielded when we apply patience and care to the process of both. The care and passion with which Loren writes are palpable in this collection. While reading, I found myself needing to put down the book repeatedly in order to soak in the full weight of the words; I found myself purposefully slowing down my reading in order to enjoy the book longer; I found myself scribbling quotes and thoughts in my notebook. I found myself throughout Animal, Mineral, Radical, both piqued and deeply satiated.